From registered nurse and public health advocate Sana Goldberg, RN, a timely, accessible, and comprehensive handbook to navigating common medical situations. From the routine to the unexpected, How to Be a Patient is your ultimate guide to better health care. Did you know that patients have statistically better outcomes when their surgeon is female? That you can mark up an informed consent sheet before you sign it or get second opinions on CTs and MRIs? That there’s a blue book for health-care procedures or an algorithm to decide between ER, urgent care, and waiting until Monday? 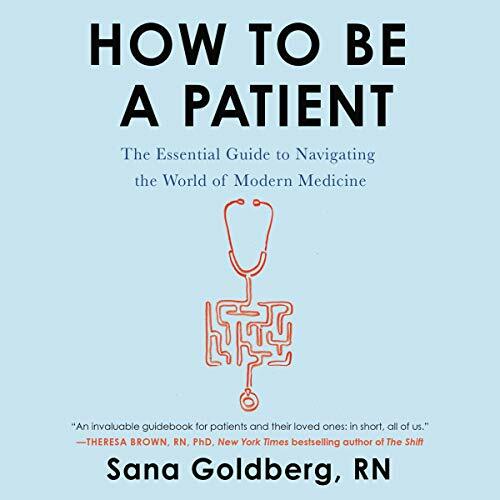 In How to Be a Patient, nurse and public health advocate Sana Goldberg walks listeners through the complicated and uncertain medical landscape, illuminating a path to better care. Warm and disarmingly honest, Goldberg’s advice is as expert as it is accessible. In the face of an epidemic of brusque, impersonal care, she empowers listeners with the information and tools to come to good decisions with their providers and sidestep the challenging realities of modern medicine. With sections like "When All Is Well", "When It’s an Emergency", "When It’s Your Person", and "When You Have to Stand Up to the Industry", along with appendices to help track family history, avoid pointless medical tests, and choose when and where to undergo a procedure, How to Be a Patient is an invaluable and essential guide for a new generation of patients.